Parade The festival began with a parade involving more than 80 eagle hunters on horseback. In a small region of western Mongolia that closely resembles western Wyoming, Kazakh eagle hunters carry on a tradition of living and hunting with female golden eagles. More than 400 eagles hunters live in this region. Last week, the hunters gathered for their annual eagle festival, which kicks off the winter hunting season. The hunters use the eagles primarily to harvest marmots, fox and wolves. The hunters mostly make their living from migratory livestock production. Biker bird Eagles are everywhere at the festival, with horses and motorcycles the preferred modes of transport. Conversation Two hunters stop their horses to sit and visit. Eagle hunter 1 The hunters pose for photos with their birds. Eagle eye Female goldens are used for hunting because they are larger and more aggressive than the males. Lure A hunter uses a dead rabbit as a lure to get his bird from the sky. Eagle hunter 2 Not used to having their photos taken, but liking it! Talons This photo shows an eagle's talons and tethers. Group rides A group of eagle hunters rides across the steppe, journeying three days on horseback to attend the festival. Eagle hunter 3 Coats are made from everything from horse and cow hides to marmot and fox fur. Eagle landing An eagle coming in to the lure. Hunt group This group took advantage of the mountains near the festival site to hunt fox while traveling through. 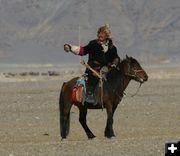 Arlbay Arlbay races across the Mongolian countryside en route to the festival. 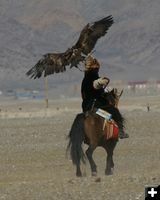 Series 1 Abutalib takes his eagle to the rock to begin the competition, with Armanbak there to settle her in place. Series 2 Abutalib rides away down the hill while Armanbak positions the bird for her flight. Series 3 Abutalib calls to his eagle, tempting her with a meat treat. Series 4 The eagle launches into the air at the sound of her hunter's call. Series 5 The eagle continues her flight to Abutalib. Series 6 The eagle lands on her hunter's hand.